people like trekking, but they also love to swim at seaside. Could I have 2 prillages within a single trip? Yes, you can. 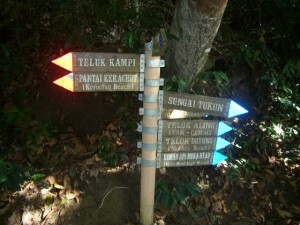 You are so lucky because Pantai Kerachut Beach or Monkey beach at Penang National Park will fulfill these 2 criteria. Many people visited Penang but still wonder where is Penang National Park? At Penang Botanical Garden or nearby Batu Ferringgi hotel area? 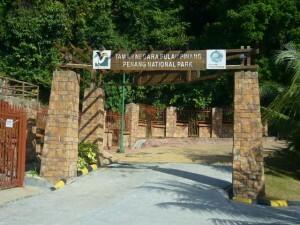 The answer is Penang National Park locates at Teluk Bahang Area, it located at north-west of Penang island. Penang National Park is about 25km away from George town. Take the direction to Tanjong Tokong, than follow the double lane, twist and turn snaky road ahead to Batu Feringgi direction. You will see many famous hotel along the journey, like hotel Flamingo Penang, 6-star Shangri-la Spa Resort, the full of enthusiasm Hard-Rock hotel. You can always step out from the car to get a refreshment drink after long driving, however there are still a few km away from the National Park. Continue the journey until you see a round-a-bound, ahead at 12 O’ Clock direction, the National Park entrance appears in front of you after 1km later. If you are lucky without getting into heavy traffic jam, you should be reaching the Penang National Park Entrance after 1 hour. 2 major trekking trail at Penang National Park. Both trails are about 3km in length from entrance. For a slow mover like myself, it takes me about 1 hour 30min to reach the destination. In this post, I am going to share with you some images about the Kerachut beach, will talk more about monkey beach in separate blog. Regardless which trail you select or even just have a short walk in the Penang National Park, remember to register yourselve and your direction at the National Park entrance before you start exploring the trek. Either you are selecting Monkey beach or Kerachut Beach, both trails are classified under moderate trail. 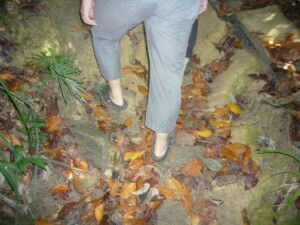 But due to high humid and walking in the jungle trek, you may start sweeting like nobody business. Please bring sufficient drinks. Even you are sweeting and sometime even can hear your own heart beat, but just enjoy the trail. Make sure you say hello and keep a simple smiling, this will enlight everybody’s life. Follow the sign board and trek path on the ground, watch your step along the trek. You may find some natural human carve step along the trail, but it should not stop you. Penang National Park currently comes with free enrance, it is more like a natural kind of environment along the trekking. You will enjoy if you really like natural.